This is the first post in a new series here at The District Table called Food Beginnings. I plan to occasionally highlight the history behind different foods and look into the story behind them. For my first feature, in honor of Mardi Gras today, I am taking a look at why people celebrate this day with king cakes, what the colors mean, and why the heck there is a plastic baby inside. First of all, what is a king cake? This oval-shaped cake is made with cinnamon-laced dough, often braided, sort of a cross between coffee cake and French pastry. It is actually more like a bread than cake, which is covered with icing and often decorated with purple, green, and yellow sprinkles. You can find a wide variety of king cakes with different fillings, from cream cheese to pecan praline. The cake is decorated with the three colors of Mardi Gras: purple, green, and yellow. Purple, a symbol of justice, green to represent faith, and gold to signify power. In the past, a coin or bean was hidden inside the cake. Whoever found the item was said to have good luck in the coming year. Today, a small plastic baby has become the most common prize to find in the cake. The recipient is then crowned king or queen of the party, and is responsible for hosting the next king cake gathering (or at least bring the cake). A lot people like to associate the small plastic baby with the baby Jesus, but that is unofficial. It was actually a salesman who first suggested that a small porcelain baby to put in the cake instead of a bean, thinking that it would be easier to find. King cakes are served during the whole Carnival season. The season kicks off on January 6 with the Twelfth Night (also called the Epiphany) that celebrates the three wise men visiting baby Jesus. The King Cake, decorated in three colors, honors the three kings (get it??). The cakes are perhaps the most popular on the day of Mardi Gras. Called Fat Tuesday by some, this is the last day of indulgence before Lent in many Christian religions. Lent is an entire 40 days of fasting and reflection–ergo the brief Carnival season of feasting, costumes, and “merrymaking” beforehand. Enter: New Orleans. 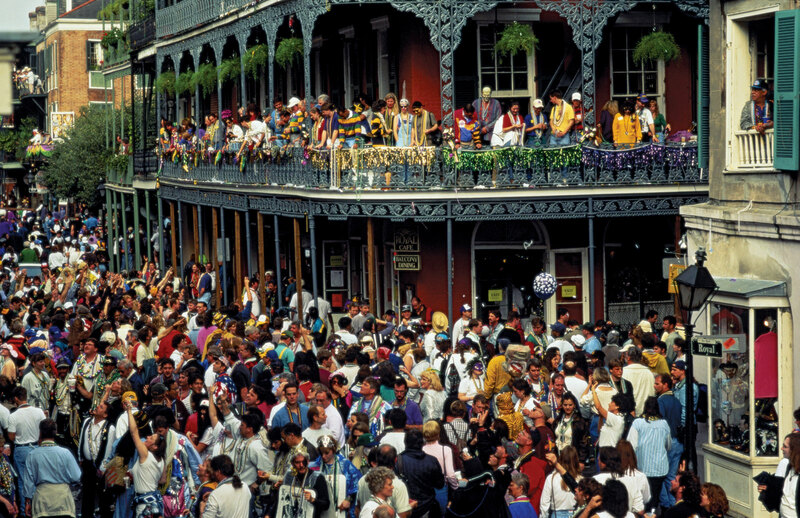 What exactly has made New Orleans the center of the Mardi Gras party in the U.S.? The celebration made its way from France to North America in 1699. A French explorer, Pierre Le Moyne, arrived on the Mississippi River at a point about 60 miles south of New Orleans. 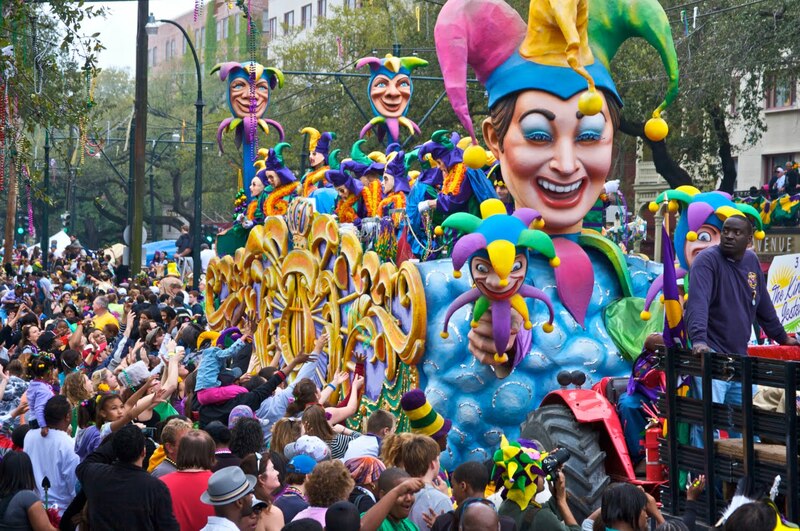 The next day happened to be Mardi Gras, a day that has been celebrated in Europe since the Middle Ages. Therefore he christened the site Point du Mardi Gras. So began the holiday’s celebration in Louisiana. 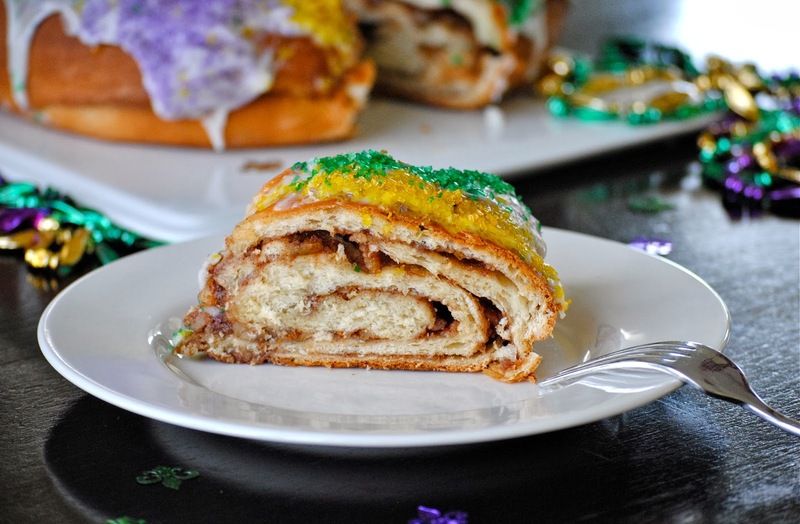 If parades and beads aren’t your style, you can still celebrate Mardi Gras with a delicious King Cake. Now you can even provide a short story to your guests about its origins. King cakes are shipped from Louisiana to all over the U.S., or (if you’re lucky) your local bakery might offer them. The Kitchn even has a detailed guide on how to make a king cake, if you are feeling adventurous. 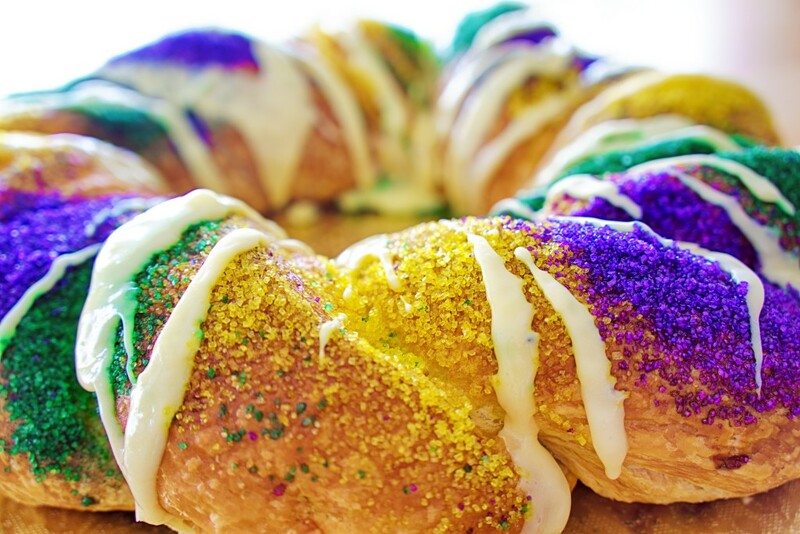 Let us know about your King Cake traditions in the comments! Have you ever made one? Great idea to share the history of food and the King Cake seems aptly colorful as befits New Orleans etc! Here in France la Galette des Rois is only served once a year and every child in France waits for 6 January (Epiphany). To honor the Three Kings who traveled from afar to welcome the baby Jesus. It was probably organized by an opportunistic pâtissier who saw the opportunity of a huge market. It is a marvelous party dessert as it is the custom to hide two little figurines in the almond cream. The ones who find them will become the King and Queen for the day and of course have all of their wishes realised. Two paper crowns are often supplied with the puff pastry cake. Undecorated it is filled with almond cream. An opportunistic pâtissier indeed! Quite a trend they started. Thanks for sharing Brett, I love reading about the different interpretations.